A community for Digimon game fans to interact. Bandai Namco has opened a Japanese “Digimon Game Community” website. 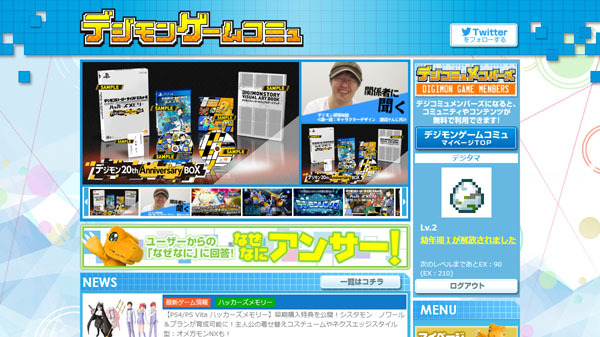 Among other pages, the website features a bulletin board where fans can interact with each other, as well as a Q&A Corner where fans can interact with developers. The Q&A Corner will feature real answers from the developers in response to user questions and requests. Access to most pages are restricted to registered users, but registration is free (and in English). Logging into the website will even let users raise their own partner Digimon from a Digi-Egg by gaining experience points. If you register, be sure to set your region to Asia / Japan, otherwise you will still be locked out of accessing any member-only pages. Furthermore, the website has an exclusive interview with Kenji Watanabe, who has been in charge of character design since the release of the original Digimon toy that started it all in 1997. The latest Digimon game, Digimon Story: Cyber Sleuth Hacker’s Memory, is due out for PlayStation 4 and PS Vita in Japan on December 14, and in North America and Europe in early 2018.